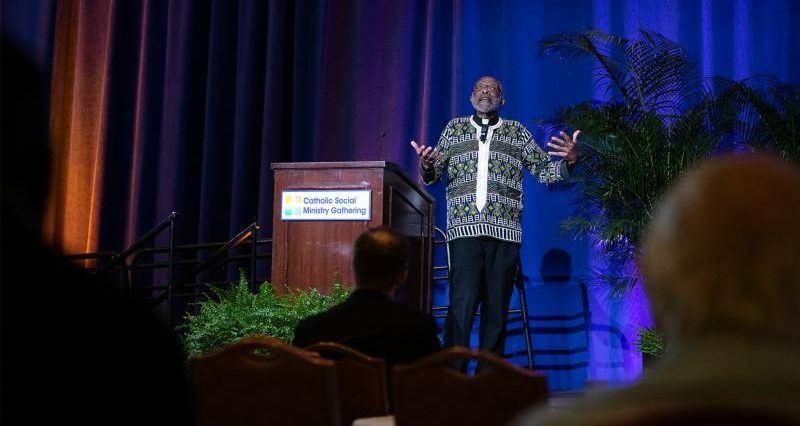 WASHINGTON (CNS) — Racism can be ended in the United States, but the past has to be confronted first for that to happen, said a Harvard professor and author who participated in a panel discussion on racism Feb. 3 as part of the Catholic Social Ministry Gathering in Washington. Father Maurice Henry Sands, executive director of the Black and Indian Mission Office in Washington and a self-described “FBI — Full-Blooded Indian.” He is a member of the Ojibway, Ottawa and Potawatomi tribes, who are known together as Anishnaabe. “The most important thing for me is to forgive the injustices that have been committed, and to forgive the people who did it,” the priest said. Segura said, “The image I have of the undocumented community is that of a battered woman.” After repeated insults and assaults, she added, “it is better to be numb” in order to carry on. “You would be surprised how many times we tried to schedule festivals for our saints and they would say no: ‘We don’t want those things in our community. You’re too divisive,'” said a fourth panelist, Father Patrick Longalong, a Filipino-American priest, a pastor in the Diocese of Brooklyn, New York, and the diocesan coordinator of ministry to Filipino immigrants. “The Gospel of Jesus Christ is what changed my life. It changed my parents’ lives. And it’s what we need today,” Father Sands said. But it will be a hard sell for Catholics, he warned, because of their history with the “Indian schools” that took children from their homes and sent them hundreds of miles away for schooling. “My grandfather — my mother’s father — and my mother’s mother were both taken away to Indian school,” Father Sands said. “It ruined their lives, it ruined their children’s lives. And the next generation’s. Hinton, some of whose family members were incarcerated, said she was too scared to step inside a prison to visit until she was in her 20s. She cited statistics from the Vera Institute for Justice to show how disproportionately African-Americans are treated in the justice system. Segura told the tale of a hard-hearted county sheriff in the Archdiocese of Chicago who had acquired more police officers, police vehicles and a fresh batch of blank tickets to issue citations among the county’s Hispanic population.